Arcanum’s Taylor Gray (13) with a smash over the net during the Trojans’ second round match against Tri-Village on Saturday in the Darke County Volleyball Invitational held at Arcanum. The Trojans won the overall championship later in the day by defeating Franklin-Monroe in the finals. 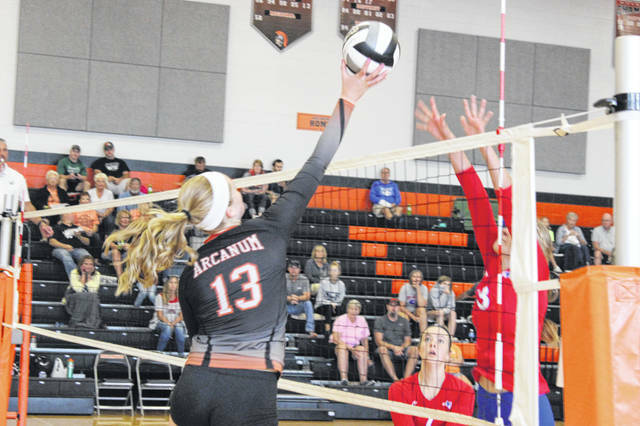 ARCANUM – The Arcanum Trojans were crowned champions of the Darke County Invitational sponsored by Greenville Federal on Saturday. The Trojans won three straight matches to claim the tournament championship. They defeated Newton 25-18, 25-19 in the first round, then knocked off Tri-Village 25-17, 25-20 in the second round to earn a spot in the title bout with Franklin-Monroe. Arcanum rallied from behind in the first game to win 29-27 and then finished off the title run with a 25-15 victory in the second game. Stats were not available from the championship game, but against Tri-Village the Trojans were led by Taylor Gray with 9 kills and 13 digs, Camille Pohl with 6 kills and 21 digs, Macey Hartman with 25 digs and Sadie Sink with 15 assists. Also contributing in the win over the Patriots, Audrey Heiser (3 kills, 2 blocks), Jenna Haney (2 blocks) and Gracie Garno (18 digs). Against Newton, Gray led the way with 10 kills, 8 assists and 1 ace. Pohl had 6 kills and 10 digs, while Heiser added 5 kills and 2 blocks. Sink had 12 assists and 1 ace and Hartman had 7 digs. Tri-Village finished in third place after knocking off Greenville in the third-place match. The Patriots won 25-16, 28-26. Greenville was led in the game by Madilyn Francis and Abbie Yoder each with 5 kills. Brooke Stachler also contributed 14 assists and 6 digs for the Lady Wave. Greenville lost to host Vandalia Butler last week in four games, 25-21, 18-25, 25-18 and 25-13. Emma Klosterman had 12 kills to lead the Lady Wave. Also contributing for Greenville was Madilyn Francis with 10 kills, Brooke Stachler with 24 assists and Shelby Herman with 21 digs. Arcanum’s Tanner Delk was the individual champion in the boys small school race at Milton-Union’s Bob Schul Invitational on Saturday. Delk’s overall time was 16 minutes, 46.9 seconds, nearly 7 seconds ahead of runner-up Noah Smith of West Liberty-Salem. His win also helped the Trojans to a 10th-place finish in the team standings with a score of 282 points. Also competing for Arcanum was Landon Kreusch (18:27.6) in 40th place, Logan Todd (19:26.9) in 80th place, Ethan Moores (19:27.9) in 81st place and Dakota White (19:29.3) in 84th place. Other local teams competing at the meet were Versailles (353 points), which came in 14th as a team, Bradford (701) in 27th place, Franklin-Monroe (734) in 28th place, Ansonia (757) in 30th place, Tri-Village (986) in 34th place and Mississinawa Valley (1,103) in 37th place. For Versailles, Brooks Blakeley led the way finishing in 20th place with a time of 17:43.3. He was followed by Stuart Baltes (18:22.1) in 35th place, Alex Brewer (19:39.3) in 94th place, Logan Miller (19:54.5) in 106th place and Jack Gehret (19:55.0) in 107th place. For Bradford, Jay Roberts was the lead runner in 78th place with a time of 19:24.9. Also for the Railroaders, Jackson Moore (19:31.9) in 86th place, Aidan Beachler (20:19.3) in 127th place, Shane Bryan (23:13.2) in 275th place and Jared Shellabarger (23:57.4) in 292nd place. Franklin-Monroe runners were Brenda Hosler (19:43.7) in 97th place, Ross Thayer (20:35.8) in 147th place, Jacob Meyer (20:50.3) in 160th place, Dylan Brumbaugh (21:52.2) in 215th place and Logan Garber (22:15.8) in 232nd place. For Ansonia, Logan Warner (18:48.6) in 51st place, Kyle Thornhill (21:25.1) in 192nd place, Garrett Kaiser (21:39.5) in 198th place, Michael Hall (22:10.7) in 225th place and Chad Milikin (22:54.0) in 260th place. For Tri-Village, Harley Ketring was the top runner in 19:18.2 to finish in 74th place. He was followed by Matthew Holzapfel (23:21.6) in 278th. Ryan Stephan (26:30.6) in 339th place, Cameron Armstrong (27:21.9) in 346th place and Kamran Stucky (33:14.8) in 367th place. Mississinawa Valley placers were Dalton Marker (21:18.9) in 185th place, Connor Buffenbarger (25:53.0) in 334th place, Jacob Dirmeyer (26:32.3) in 342nd place, Davian Trump (33:47.5) in 369th place and Angel Avilez (34:01.4) in 370th place. Riley Emerick placed 11th overall with a time of 17 minutes, 38 seconds in the Northmont Invitational last Saturday. His time helped the Green Wave to a seventh place finish in the team standings with a score 177 points. Also contributing to the GHS team score was Alex Subler (18:46.6) in 32nd place, Matt Karns (19:06.5) in 41st place, Seth Shaffer (19:39.0) in 53rd place and Gabriel Stevens (19:54.0) in 57th place. Versailles totaled 134 points to place third out of 20 teams in the Bob Schul Invitational on Saturday at Milton-Union. The Tigers were led by Liz Watren, who finished 16th individually with a time of 21 minutes, 21.9 seconds. Joining her in leading Versailles were Madelyn Holzapfel (21:55.8) in 27th place, Kara Spitzer (22:07.8) in 32nd place, Lauren Menke (22:36.1) in 37th place and Emma Peters (22:46.0) in 39th place. Bradford was the next best local team at the meet finishing in eighth place with a score of 220 points. Other local teams to place at the meet were Ansonia (387) in 13th place and Arcanum (392) in 14th place. Franklin-Monroe, Mississinawa Valley and Tri-Village also competed but did not have enough runners to earn a team score. Skipp Miller led the Railroaders with a time of 21:01.9. She was the highest local individual finisher in 14th place overall. Also contributing to Bradford’s team score were Austy Miller (21:27.1) in 18th place, Olivia Daugherty (23:22.7) in 52nd place, Mercedes Smith (24:32.3) in 83rd place and Jenna Shellabarger (26:05.9) in 122nd place. For Ansonia, Lydia Snyder was the top runner (24:29.9) in 82nd place. Olivia Wright (24:33.2) was next in 84th place followed by Cierra Rosinski (25:10.2) in 101st place, Emily Wright (25:16.7) in 102nd place and Deanna Moody (33:47.6) in 190th place. For Arcanum, Lydia Shannon was the top runner with a time of 23:49.3. She finished in 61st place. Joining her in contributing to the team score were Aidan O’Brien (25:19.0) in 103rd place, Chloe Eberhard (26:00.1) in 118th place, Regan Weaver (26:41.1) in 130th place and Elora Sudduth (27:36.3) in 141st place. Franklin-Monroe had three runners in the race led by Selene Weaver (22:21.1) in 36th place. Also for the Jets, Nicole Brocious (23:20.1) in 49th place and Raegan Warner (24:27.6) in 80th place. For Mississinawa Valley, three runners competed led by Noemi Arrona (29:17.8) in 162nd place, Maria Ojeda (31:57.0) in 182nd place and Madison Hayes (35:13.5) in 193rd place. And for Tri-Village, four runners were led by Lissa Siler (26:05.0) placed 121st overall. Meredith Butsch (28:01.4) was next for the Patriots in 148th place followed by Emma Printz (29:26.9) in 164th place and Samantha Combs (30:18.5) in 168th place. Isabelle Rammel and Lauren Dull competed for Greenville in the Northmont Invitational. Rammel was the top finisher for the Lady Wave with a time of 21:15.7 in 17th place overall. Dull came in 63rd place with a time of 23:51.9. In a pair of matches last week, the Versailles boys golf team won one and lost one. The Tigers defeated Russia 173-199 with Alex Keiser and Ethan Kremer sharing co-medalist honors each carding 42s on the par-35 Stillwater Valley Golf Course. Also contributing for Versailles in the win was Connor VanSkyock with a 44 and Austin Pleiman with a 45. Against St. Henry, VanSkyock was the match medalist with a 41, but the Tigers lost the team match by a score of 178-182. Also scoring for VHS was Keiser (45), Will Eversole (47) and Kremer (49). Versailles is 4-1 overall in dual matches and 3-1 in the Midwest Athletic Conference. Dylan Holsapple carded a 43 to earn medalist honors as Tri-Village defeated Bethel in a match last week, 193-246. Gage Hileman added a 44 for the Patriots, who also got contributions from Aidan Collins (48) and Josh Sims (58). Arcanum’s Lexi Unger shot a 51 to earn medalist honors in this Cross County Conference dual match last week at Beechwood Golf Course. Her sore helped lead the Trojans to a 225-270 win over Tri-Village. Elliana Sloan (54), Madison Mankin (60) and Sydney Artz (60) also contributed to the Trojans team score. For the Patriots, Andi Bietry led the way with a 54 followed by Kloey Murphy’s 64, Camryn Wyne’s 71 and Lily Preston’s 81. Jada Garland shot a 46 last week to lead the Lady Wave in a dual match win over Piqua, 208-214. Also scoring for Greenville was Madelyn Breig (53), Lainey Oswalt (53) and Jessica Mortensen (56). Piqua’s Kelsey Bachman shot 45 to earn medalist honors. Greenville captured both doubles matches en route to a 4-1 win over Northmont last week. The first doubles tandem of Marabelle Lance and Anna Manges managed a hard fought win over April McCain and Amber Peters, 6-4, 6-3. It was this win that clinched the match for the exuberant squad from Darke County. At second doubles, the duo of Faith Mansfield and Emily Marchal defeated Amy Slusher and Rachel Smith, 6-2, 6-2. In singles action, Natalie Milligan won her match 6-1, 6-0 over Amy Anderson, while Abby Swensen took care of her second singles opponent – Andrea Surrell – by a 6-2, 6-0 count. Northmont’s one win came at third singles with Hannah Jenkins defeated Felicity Lance, 6-0, 6-4. In junior varsity action, Katie Baughman won 8-1 at first singles and Amanda Chui scored an 8-6 win at second singles. The doubles squad of Emma Tutwiler and Cheyenne Hartsock won out by doubling their score at 8-4. Lastly, Erin Stephens and Rose Blocher blocked shots well at the net for an 8-3 victory. Greenville swept host West Carrollton last Thursday at both the varsity and junior varsity levels. Winners included Natalie Milligan, Abby Swensen, Felicity Lantz, Marabelle Lance, Anna Manges, Faith Mansfield, Emily Marchal, Katie Baughman, Amanda Chui, Emma Tutwiler, Cheyenne Hartsock, Rose Blocher and Erin Stephens. The tennis squad plays today at Xenia on their new courts at the Fairgrounds. This entry was tagged Ansonia, Arcanum, Bradford, CCC, Franklin Monroe, Greenville, GWOC, MAC, Mississinawa Valley, Tri-Village, Versailles. Bookmark the permalink.